Soup’s up! Grab your crackers and toasted bread, and ready your spoon! When you crave comfort and convenience, look no further than soup. While we love soup, we can do without the hassle and time it takes to prepare a homemade bowl of goodness. And let’s be honest, the canned, sodium-filled stuff simply won’t do most nights. That’s why we’re breaking out the slow cooker for a hands-free approach to a complete dinner made from scratch. 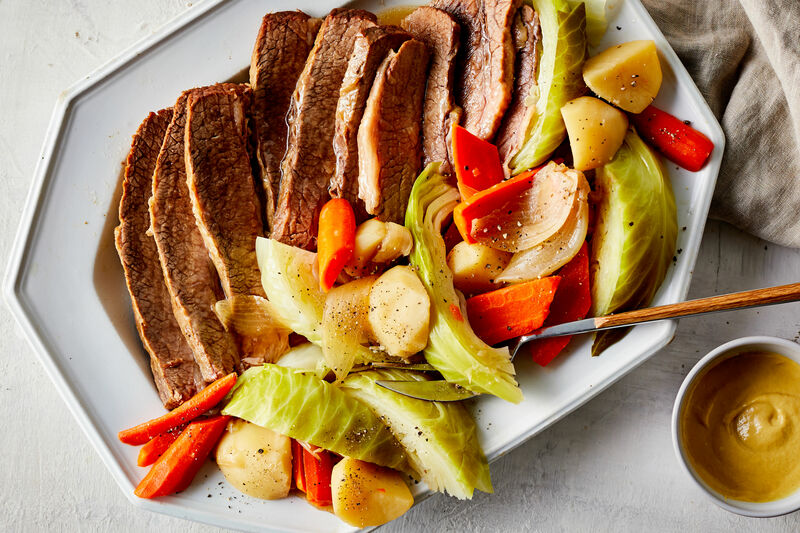 It doesn't get any easier—or any more delicious—than throwing a few fresh ingredients in the slow cooker and letting it do all the work while you work. All you have to do is set it and forget it in the morning, and come home (with an empty stomach) to these warm and satisfying stews and soups that are just waiting to be devoured. Prepare this minestrone in your slow-cooker over the weekend. Freeze the soup for later. All you have to do when your short on time is reheat the soup and cook the pasta. This chowder recipe is perfect for game-days or weeknights when the family is all together. This potato soup is creamy and rich from ham hocks and spending time in the slow-cooker. If you like the savory combination of ham and beans but don't have a lot of time to spend in the kitchen, let this savory slow-cooker recipe come to the rescue. Just what the doctor ordered—our take on the childhood classic has a grownup spin that we know you’ll love. Take a break from tradition with a bowl full of white chili, complete with tender chicken, white navy beans, and spicy seasonings. Say hello to a simple one-pot meal for dinner tonight. White beans, carrots, parsnips, garlic, and smoked Italian sausage make up this rich, dense stew. Cooked slowly over the course of an afternoon or evening all of the delicate flavors of these ingredients come together in a mixture of balance and bite. Enjoy the ball game, go shopping, or work in the yard. Return to the kitchen a few hours later to find a warm pot of flavorful brisket chili waiting for you and your family. No dish is quite as soothing as a hearty bowl of chicken noodle soup, and the slow cooker couldn't have made the road to comfort any easier. Chili is a wintertime staple, and this slow cooker version is excellent served on its own with cornbread or on top of hot dogs. These soft and fluffy cornmeal dumplings bake up right in the slow cooker on top of an aromatic chicken stew. This one will make you want to fill up a bowl and curl up on the couch. This Green Tomato Chile Verde sounds like it will be hot as blazes, but the poblano peppers bring a mild, mellow heat to this delicious dish. We also love the tang and body that green tomatoes give this comforting stew. A steaming hot bowl of hearty soup served out of a toasted bread bowl warms our hearts in such a distinct and fulfilling way. This comfort soup requires some prep work, but the soul warming result is worth every minute. This is how a chili should be: spicy, savory, and delicious. Grab a spoon and savor every bite. Pork rib pieces are the savory meat that makes this chili so irresistible. Tender cubed sweet potatoes add color and flavor to this richly spiced beef stew. Our reviewers rave that this recipe is “wonderful and easy,” and “definitely a keeper.” Enjoy a smoky and spicy classic that takes just a few minutes prepare, and then slow-simmers in a slow cooker so that the classic Louisiana flavors have time to soak into each other. Lean ground turkey replaces the usual ground beef in this richly spiced, veggie-rich chili. Beef brisket makes a great filling for tacos, and slow-cooking it for hours, covered in a spicy sauce, makes it even better.